The David Rumsey historical maps "Featured Content" layer seems to be very popular. What some people don't realize is that it is possible to overlay any historical map image you have yourself. Soren Johannessen of Copenhagen, Denmark certainly has figured it out. He has posted a collection of seven maps of Denmark (2.4 Mbytes) from 1570 to 1873 showing the progression of map knowledge. This clearly illustrates the improvements in cartography accuracy over time. Just turn on each map one by one to see the different maps. Turn on the "Borders" layer to see how accurate/inaccurate the maps are compared to the modern day maps. Excellent work Soren! For tips on creating your own image overlays, read this entry from the Using GE Blog. And, here are basic instructions on creating image overlays from the GE 4 user guide. Only thing is how you georeferenced a very distorted map like the ones you see in these examples.... As far as I can see, S�ren used several points in Sweden and Norway to reference the images (usually it's a good idea to get some points in the corners), but in this case where the map is so distorted, it's not a very good idea. 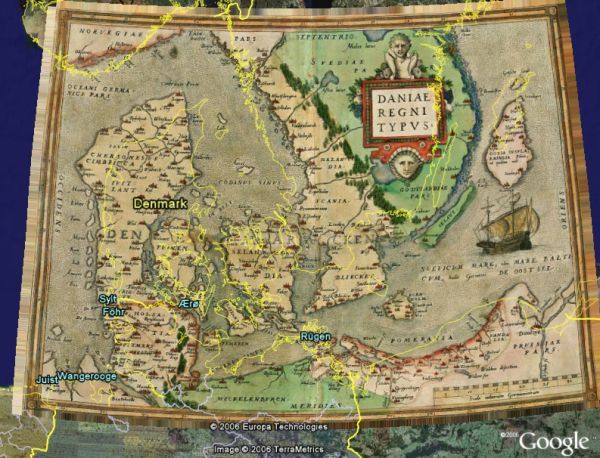 For instance if you look at the 1665 map, Denmark is too wide, probably because the relation between Denmark and the surrounding countries are very off. If this were to show Denmark, he should have used ground control points in Denmark only, and ignored the accuracy of Sweden and Norway. How to do overlays is one of the most popular of my 'how to' videos on www.kokae.com, there is a knack to doing it more than just understanding the controls. On the screenshot I noticed that there is the same problem with overlays that I too have had since Google Earth 4 Beta was first published. Strange dragged pixel lines around the overlay's borders really make it look ugly, especially when overlaying several images on top of each other. I wonder when this bug is going to be fixed... every update of GE4 beta I hope for improvement, but no dice. Too bad, because I'm not renewing my Plus-account till they do. Jon, the bug has to do with Anisotropic Filtering. Rumor has it the bug will be fixed in the next release. In the meantime, I try to remember to turn AF off before taking screenshots of overlays.